Northern Ireland's woes have increased ahead of Wednesday's Nations Cup match against Scotland after George McCartney quit international football. Jonny Evans and Warren Feeney joined Northern Ireland's long absentee list on Tuesday before news of McCartney's international retirement came through. "I was informed on Sunday that George was retiring from international football," said boss Nigel Worthington. Sunderland player McCartney, 29, is currently on loan at Leeds United. 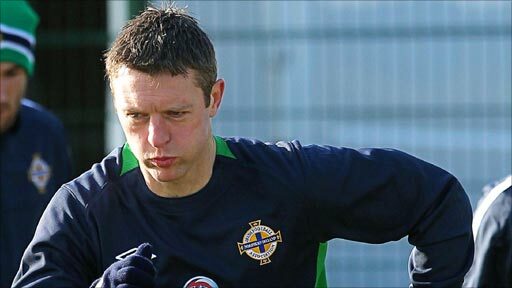 The defender previously quit Northern Ireland duty during Lawrie Sanchez's reign but was coaxed back by Worthington. 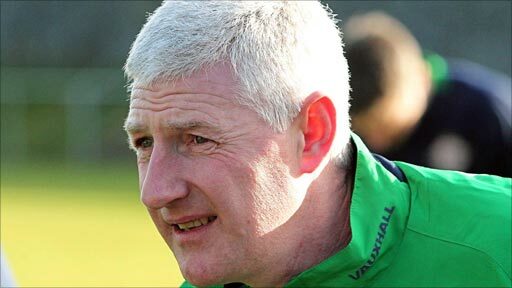 McCartney opted out in 2005 after having a disagreement with Sanchez but was convinced to return to the Northern Ireland fold after Worthington's appointment in the summer of 2007. Worthington said on Tuesday that he had to "respect" McCartney's latest decision. Feeney and Evans both have pulled out of the squad for Nations Cup game at Dublin's Aviva Stadium after suffering ankle injuries in training. Already ruled out by injury and illness are captain Aaron Hughes, Chris Brunt, Kyle Lafferty, Maik Taylor, Craig Cathcart, Sammy Clingan and Jonny Gorman. Watford pair Adam Thompson and Lee Hodson, Aberdeen's Rory McArdle and Manchester United's Oliver Norwood have already been brought in as replacements but Worthington does not plan to make further additions to his 17-strong squad. Motherwell defender Stephen Craigan will captain the NI team. It is the first time Harlow-born Thompson has featured in Nigel Worthington's squad. A product of the academy at Watford, he signed his first professional contract in November. Northern Ireland's record scorer David Healy is back in the squad after being left out for the game against Morocco in November. Former Cliftonville striker Liam Boyce earned a call-up after his move to German club Werder Bremen in September. Boyce has been scoring regularly for the Bremen outfit's under-23 side, which is effectively the club's reserve team.